How to schedule your tweets and increase your brand engagement? On Twitter, people post content with an enormous speed – around 6000 tweets per second. What brand like yours should do to keep getting engagement in this crowd? Yes, it should keep posting. However, you can`t add new tweet every time you want or if you have free time. 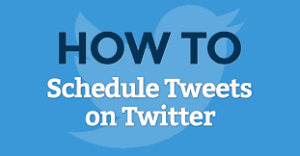 The most workable method of increasing your brand engagement is scheduling your tweets. If you didn`t hear about this before, read carefully, because in this article we will tell you how to schedule your content on Twitter. Before we start talking about special tools, we will show you how to set up your posting with the help of the social media you use. The native Tweet scheduler only lives in the Twitter ads portion of the Twitter dashboard. To use it, you should click on the “Compose” button or use the “Creatives” tab in the Twitter ads panel. There, you can draft up all your content and select the Scheduling tab and determine a day and time to send it up. However, if you are not using Twitter ads, you should work with special social media tools that help marketers and developers to schedule their content. In our article, we will show you how to work with one of those tools – Sprout Social. When you are planning what content will be posted in the next few days, you know that you already have advantage over other marketers. With a strong schedule, you are able to focus on creating new content, updating your website, launching contests on Twitter and other platforms or just making a deal with other marketers. Click on the calendar icon and the day(s) you would like to publish and enter a time. 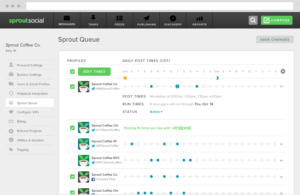 How to schedule your Tweets with Sprout Queue? If you want to surprise your readers with fun and unique content, you must be ready to post at any moment. You never know when great idea will come to mind, but with Sprout you are always ready to form a tweet and post it. You can queue your stories using browser extension or even quickly approve a draft in the Scheduled tab. Queueing up engaging content only takes a couple of clicks with Sprout`s compose box. So, as you see, there are no problems with scheduling your Tweets. You can choose from two possible methods – with Twitter and with special tool like Sprout Social. Now go and try it!